Starting from 1.12 docker version, the cluster swarm functionality has been natively added in docker. Now it’s possible to easy create docker swarm cluster where to start application containers stack. Every stack is a set of services related between them and every service is a docker container running in any node of the cluster. Every stack is accessible from external to its published ports and its services communicate between them on an overlay network (http://www.securityandit.com/network/inside-docker-overlay-network/) using the service name discovered automatically by a docker internal dns. You can find more about docker swarm cluster in https://docs.docker.com/engine/swarm/swarm-tutorial/create-swarm/. In this article I will explain how to create wordpress stacks (formed by apache and a mysql container) exposed to different published ports. This solution could be proposed for managing different virtual hosts in environment well isolated. The swarm cluster will be composed of 3 linux nodes running on amazon aws with in front a elastic load balancing for balancing the traffic from internet to the stack. A elastic file system will provide a shared storage to cluster nodes for storing the mysql database and static wordpress files. If you don’t use aws, you can use glusterfs. Please, for that read this my article http://www.securityandit.com/system/gluster-file-system-in-geo-replication/. Instead of elastic load balancing, you can use nginx or apache for managing different virtual hosts balanced to container stack.For that read it: http://www.securityandit.com/network/nginx-haproxy-and-keepalived/. Before starting to prepare the environment someone could say: why don’t use the EC2 Container Service or Google kubernets cluster in order to make a docker cluster? the answer is that I want to explain how the cluster works and I don’t want to have additonal costs using the aws or google containers. Only in this way, it’s possible to know well the docker swarm cluster and to save money. 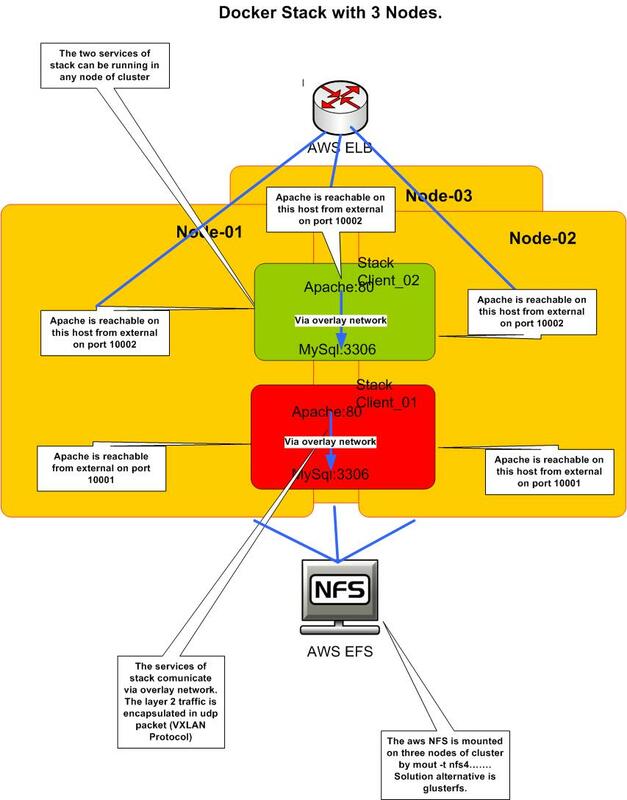 Now I created on aws cloud a elastic file system with 3 mount points in different availability zones. The role of this file system is to store and share between nodes of cluster the wordpress static and dynamic content. Swarm initialized: current node (ttwmajvlvd3qdlctgjhmjf6v9) is now a manager. To add a manager to this swarm, run ‘docker swarm join-token manager’ and follow the instructions. This node joined a swarm as a manager. The cluster was created with three manager. As default the managers works as worker, so it means that they can run the containers orchestrated and scheduled by the manager leader. 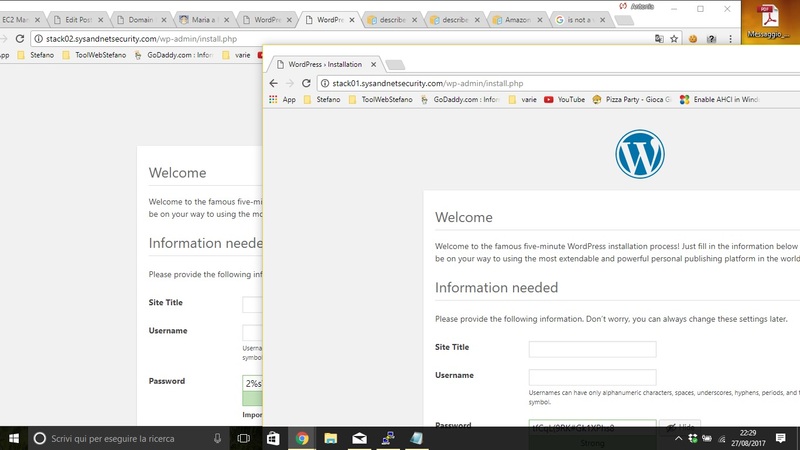 Let’s start now to discuss about how to create the two wordpress stacks. The stack is a set of micro services related between them that work together for providing together an service. Every service is a container defined in a yaml file that communicates with the other of same stack using a overlay network spanned in all nodes of cluster automatically by swarm cluster. An overlay network is implemented by udp tunnel that encapsulates layer 2 frame. For more information about overlay network, you can read my article http://www.securityandit.com/network/inside-docker-overlay-network/. Every stack is reachable in a published port defined in the yaml file. A proxy load balancer managed by swarm cluster will balance the traffic from any published port listening in any node of cluster to node where the container is listening. The communication from proxy load balancer to container happens by the overlay network. Every container can be scaled. 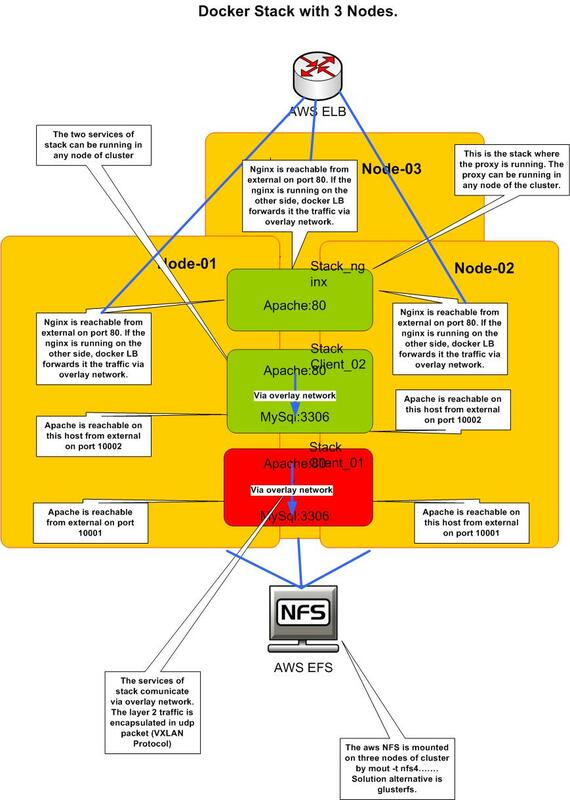 For example: with three nodes it’s possible to scale the apache of wordpress three times. The orchestrator will run an instance of container on any node of cluster and the load balancer will balance the traffic in all the containers. This is well explained in docker documentation. Every service of the stack will reference the other services with the service named defined in the yam file. The name is resolved by a internal dns with the ip address of the container in the overlay network. The two stacks are running in two different ports: 8080 for the first stack, 8081 for the second. Every node of stack is listening in this port and the traffic is balanced correctly to node where wordpress (apache + php)is running). Every stack mount a different local directory spanned by an amazon efs on all node of clusters. The directory contains the wordpress static content and the wordpress dynamic content. As I told, this can be implemented by a simple gluster filesystem. For the stack-02 the db is reached by 10.0.0.4/24 network. A secure, scalable and available infrastructure for managing virtual hosts has been created. Every wordpress and database are well isolated and if the one stack wordpress is compromised, there is no impact for the other stacks. For completing the job, it’s necessary to have a reverse proxy behind the scene for routing the traffic to right application stacks. For this type of job, I usually prefer to use nginx, but in this case I will use the elastic load balancer of aws. The traffic is balanced in function of host header: stack01.sysandnetsecurity.com is balanced to stack-01, stack02.sysandnetsecurity.com is balanced to stack-02. stack01.sysandnetsecurity.com. 3580 IN CNAME test-lb-01-1912982270.us-east-2.elb.amazonaws.com. stack02.sysandnetsecurity.com. 3580 IN CNAME test-lb-01-1912982270.us-east-2.elb.amazonaws.com. I showed how to create a swarm cluster for deploying and scaling in easy way a wordpress stack. The same approach can be used for any other applications. The benefits of security, scalability and easy management and deploy respected to classical distributed application are evident and this makes this approach increasingly popular and widespread. I used amazon aws only as laboratory, in order to avoid excessive resources consumption by virtualization system like virtual box or kvm and saving time for reverse proxy and file system distributed installation and configuration. Don’t hesitate to contact me for any questions or doubt.